That I'm hoarding in all colors. 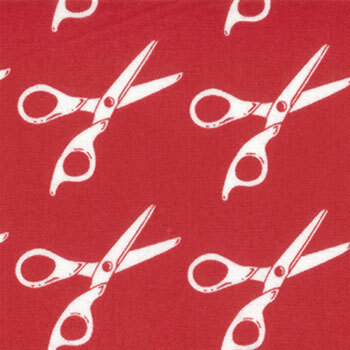 Scissor print is from Half Moon Modern collection. She has created another wonderland of whimsy and modern Japanese style. 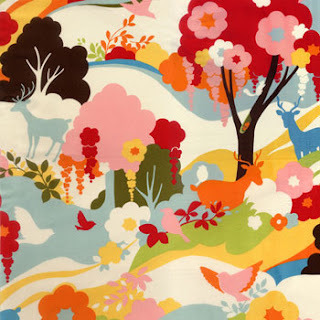 Nestled among a psychedelic rainbow of forestry are playful deer and fluttering freebirds. (That’s Japanese for Super CUTE!!!)". these are some of the 5" squares. leave a comment about what you are up to. We're packing up college daughter's stuff. it will nice to sew in there again! I love this line! I'm currently working on the second of two quilts for my cousin's baby. I am almost done with the quilting...baby's due tomorrow. I like to cut it close! Cute fabric. I'm making Fall quilts. Spent July making Christmas quilts. I am working on a menu/shopping list/cooking order for my monthly cooking session that is supposed to be Saturday. I've been a little slow on it, so it's hurry, hurry for the next few days. I am just starting a quilt for College Boy's junior year! Yeah, he goes back to school on the 26th. I can do it, right?? And just go ahead and CRY - it is good for the body and soul. :) LOVIN' ME SOME 'Oh Deer' !! I'm enjoying my holiday:) i can understand why you hoard those scissors - they are cute! We're trying to get on the UCAS website to find out my youngest son's uni offers! Oh, how cute. Right now, I'm supposed to be getting ready for work, where I've got to prepare a couple of dozen grant cases for decisions, but I decided to pause over breakfast and check in to my feed reader. Thanks for a great giveaway, and good luck to Gill in the comment above mine - my boss is in the same position. Super cute! Well, I am up to fabric shopping... hehe. Finished folding up fabrics, and found that there are still space for more! 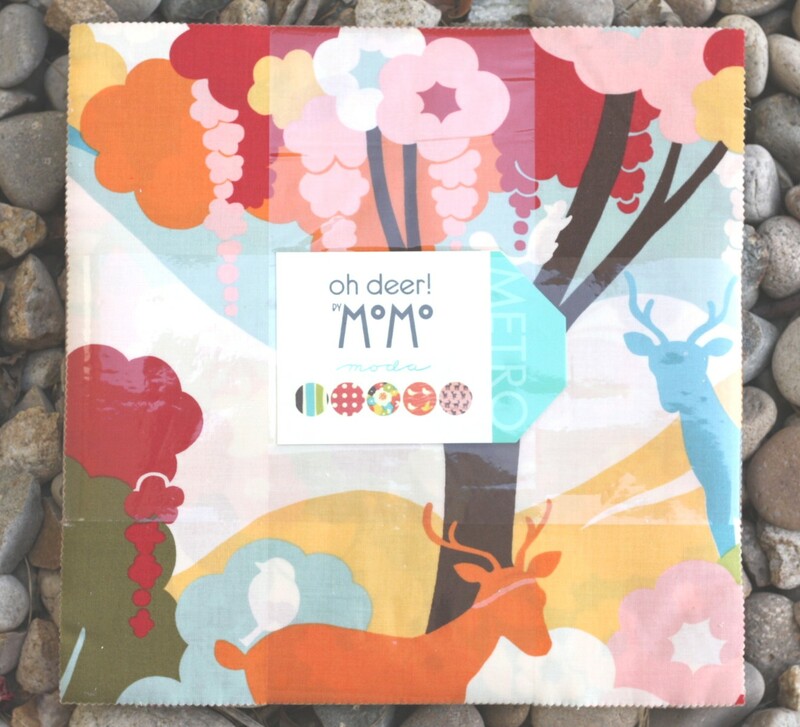 Just love these prints by Momo. I'm trying to come up with a pieced backing design for a quilt top I've just finished. I'm up to my eyeballs ...in sewing 7 bee blocks and 3 swap items plus 3 QAL's and a variety of other projects, all due by end of August! Eyeballs. so lovely, I'm trying to finish my bowl hop participation, a bee block, a hexagon top to sew up, quilt to quilt and I want to start another one...is it going to happen NO !!! I'm working out prices for bits of plastic... thrilling I know! In case it's not obvious, I'm at work, I don't do this for fun! I'm also sneakily having a bit of a blog read and dreaming about what I'm going ot make tonight. That is really cute! I've been trying to catch up and my Great Granny blocks. Don't stuff on my list before the holidays over. 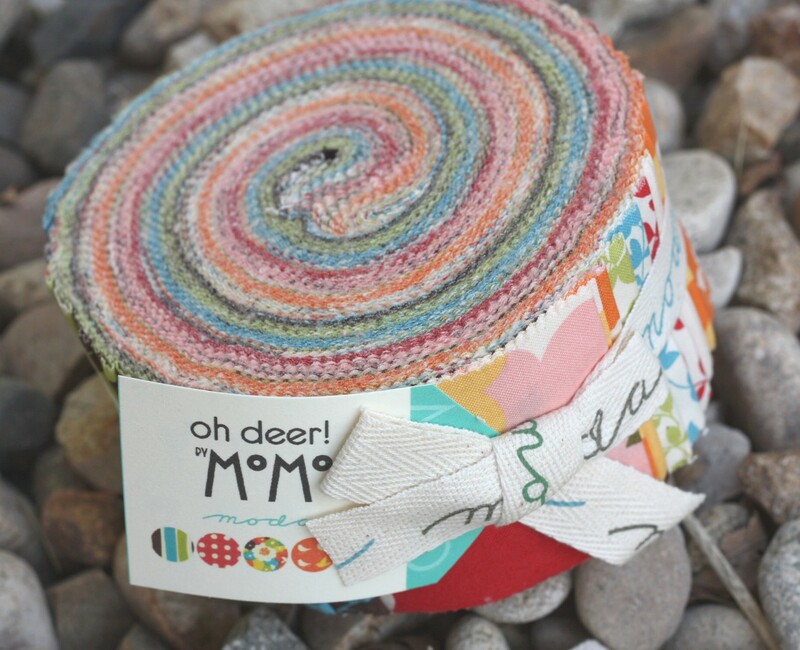 This fabric line is so cute! :) I am currently catching up on my blogs at work, then later doing preparations for my birthday tomorrow! Would be a nice present to win a giveaway! Haha. Thank you for a gorgeous giveaway. I am having a lovely week. My closest friend from university is here for a few days, and on Friday my husband and I are going away for a weekend together. This will be our first break in a couple of years and do we need it, no kids, no dogs, no cleaning. no cooking, no responsibilities!! I'm cleaning to prepare to have a family with 7 children over in a little while. I'm teaching the oldest child, 13, to sew while the others play. A busy day ahead!!! I am *finally* going to get to see my friend's new baby daughter, so excited! I'm working on quilting a baby quilt made from scraps. And I finally learned about starching which is making the quilting much nicer. And it is also my first aurifil experience. I feel so advanced! I have some cleaning, errands, etc. to catch up on after some time out of town. Once that's done though, I'm off to the sewing room to start a bed quilt that I need to have finished by Sept. 15. I am still healing from my eyelid surgery so I am not doing a lot. But I did embellish three quilt blocks with machine embroidery last night. I have been making little quilts and I have a stack that I need to start quilting them. 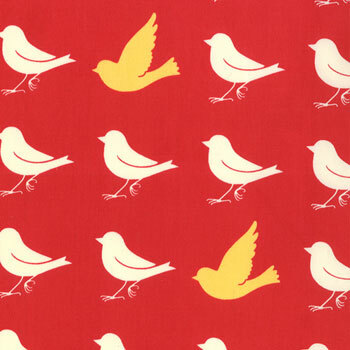 Love this fabric, I have never used anything from this designer yet! I have been sewing a custom apron as well as working on a new family quilt. I am working on a shaggy quilt for a nephew. It will feature a fish with lot's of bubbles quilted on it. (not that i did any today....housework was calling, and cattle needed mustering,and bills needed paying) Oh.... to have a few more days in the week. I'm thinking about taking my son back to college..... I haven't done much packing up, but maybe he has started?! Ha! Long road trip next week taking him back - over 800 miles. I have been sewing, but really not finishing anything. I feel like I'm in a rut! Thanks for the chance to win! so many things, just finished up a baby rag quilt and have one more to do. three quilts in various stages of progress a tube quilt, a log cabin, and one of the pattern new wave. 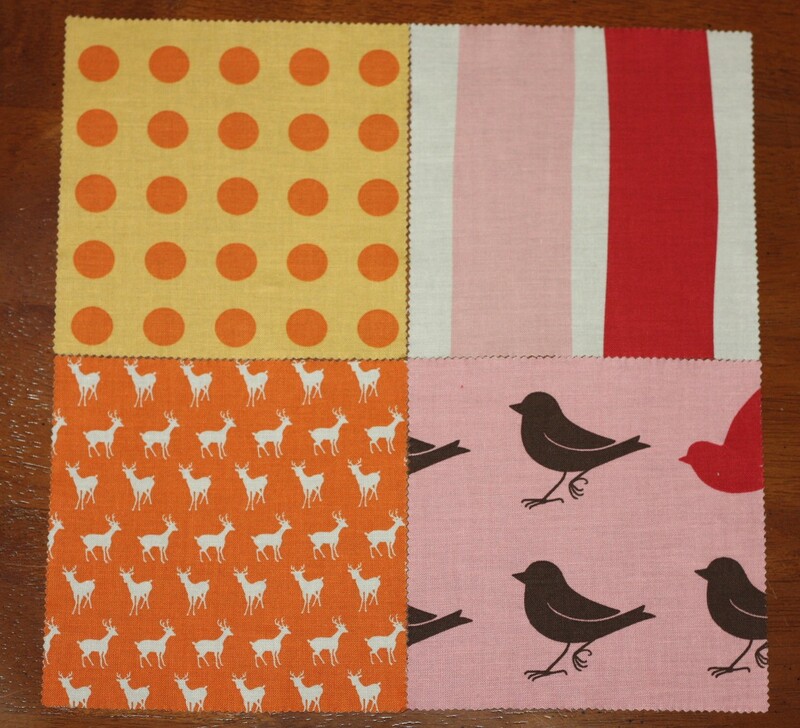 I'm sewing blocks to make a quilt for my son's 21st birthday, with the help of my online sewing bee ladies. Lovely fabric - thanks for the giveaway! I am getting ready for the first day of classes on Monday and weeping over the loss of sewing time. On the other hand, I really do love teaching. Thanks for the chance to win. Love those prints in the new line; thanks for the chance to win. I'm working on several rag quilts for Christmas gifts trying to keep cool inside away from the triple digit weather! I understand how you feel - I am packing up my daughter to go back to college and two boys to grad school! Thank you for the giveaway! I am getting my oldest child ready for Kindergarten. Oh Deer! How time flies. I'm trying to get some tote bags finished to donate to our local counselling centre. I busted 3 metres of stash getting them kitted ready to sew! Those deer are fabulous! I'm getting ready for a long weekend away. I've had to cancel two trips this year, and I'm very much looking forward to this one! 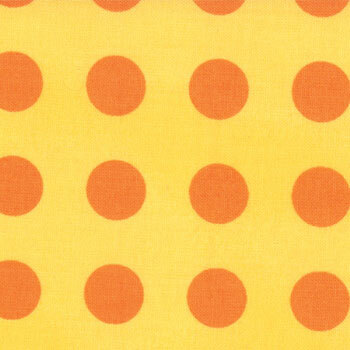 What fun and cheerful fabrics! God speed on the move and not crying. Our son is a junior at university this year and still living at home. He hasn't moved, but we helped move his sweetheart in! Up three flights of stairs too! Today I am meeting at a friend's house with some other friends for "girl time". I love it! I am at my son's house. Just brought my grands back from a two week stay with me. Enjoying time with family! I'm preparing for a work trip to Copenhagen! It is a work trip, but I can sneak off at night and I booked an extra day so I can see the sights. Right now I am catching up on a Christmas Mystery wall hanging. The new Deer fabric is pretty cool. I like the colors. I am finishing up my hand quilting on my hexagon quilt, and then I am looking at English paper piecing the Dear Jane quilt.. I did just see how teensy those pieces are, so first block I am gonna try one with the teeniest pieces and see how I do. Packing up to go canoe camping at our favorite lake...gonna be a hot one. i'm getting my kids ready to go back to school! i'll only have one left at home with me with a 2nd grader and a kindergartener. counting down the days until i have some quilting time and my house will stay clean for more than five minutes. I am trying to whip up some colorful skirts to start the school year with. Thank you for the chance. I love this fabric! I have been getting one daughter off to college in Florida and my last baby girl ready for her first day of high school;( Time sure does fly! Taking care of a sick 3 year old. Thankfully she appears to be on the mend. Thanks for the giveaway! Many sewing, too little time :) I'm sewing fabric letters and a plushie giraffe. I just got into work -- my morning ritual is to get here a little bit early so that I can spend 15 minutes or so decompressing and catching up on my quilt blog reading! Thanks for the chance to win! Lay single mom when my husband is gone for five days to Vegas starting Saturday. We are also getting ready for school to start on a week! I am working and taking care of my grand baby. I love the latter! Oh, I can so relate to you. My only daughter (of 5 kids) left two weeks ago for college *sniff*. Anyway, it got much easier after a couple of days of feeling like the house was empty. Now I'm neck deep in homeschool lesson planning. Working, sending DD off to kindergarten, and always sewing. I'm making a table runner as a gift for the family that hosted my daughter when she traveled to Singapore. I bake an apple cake because this evening my sister and family will come to have coffee.Now I`m watching tv. Hugs from Spain.It`s a sunny day!! Cute line! Love the deer print. I am wondering what to cook for dinner and googling recipes! I'm putting sashing on a quilt which will be a Christmas gift for someone and loving the rain and stormy weather! I just finished the backing for my brother's wedding quilt. Next up, I need to put together the quilt sandwich and then quilting! Woot! :) Thanks for the chance to win that cute little charm pack! Glad you're back. Hope you had a great vacation. I'm working on machine quilting stuff for other people - hoping to get caught up so I can work on some of my own projects. And if I get the chance I may do a little housecleaning. That's only if I can squeeze it in! I need to do a work out, bible study and then make an Angry Bird for my 4 yr old son! My husbands retiring from the military. We are getting ready to start a totally different life. My son has already started classes so I feel your pain. I need to be preparing for the possibility that I may be going back to work (yay! and ugh! ), but I am in denial, so I am working on my hexagon quilt! Giveaway days are back? That's great news!! Tomorrow is my last work day before vacation (I know... kinda late, but it's better than nothing! ), so I'm really looking forward to a lot of sewing, siestas, sun, beach & movies! Great new line by Momo... but that's not news!! 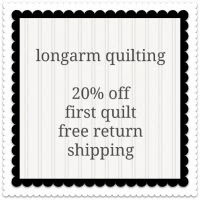 Love Giveaway Day-just getting ready to go for my daily walk before it gets too hot outside, then need to get a binding done on a red and white quilt. That fabric is beautiful! My husband and I are flying out today to visit the kids and grandkids :) Can hardly wait! Yes, it's tough when they head off. Think sewing, think sewing, think sewing!!! I loved those scissors too and the birds are pretty darn cute in this set. I'm hoping to head into the sewing mode today after I run errands. Getting ready for grandkids to spend the weekend. Need to get a little quilting done before they come since I won't be able to while they are here. 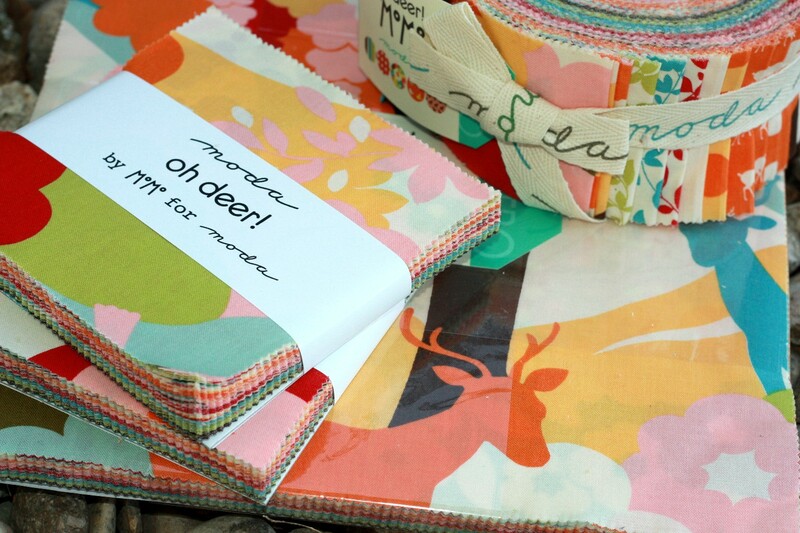 Cute new fabric line! I'm plotting my next Washi dress and my next quilt! Also, trying to get myself to start planning Christmas gifts! Making tetris blocks from the QAL at Happy Quilting. Thanks for the giveaway! I am trying really hard to finish this one quilt before I start another project. But that may not be possible since my quilt has no deadline and the birthday gifts I'm slated to make next definitely do! I am doing the Vintage Holiday QAL, and knee deep in baby quilts! Working my last day for the summer and getting ready for a few weeks of relaxing before the kids go back to school and I go back to work. Maybe there will be some extra sewing time? I'm working on a table runner for the holidays. We (DH & I) are getting ready to paint another room in the house hope to have the inside done before the year is over. I'm up to figuring out how to make pickles. This was the first time we grew cucumbers in our garden and we got a bumper crop! Sewing wise, I'm working on my blocks for the upcoming Dots on Dots Blog Hop. I just finished September's BOM block yesterday...I'm ahead of the game! First time ever and it feels good! What am I up to? Well, I'm hunting feral hogs in the Texas Hill Country and trying to win this fabulous charm pack. Thanks for the opportunity. Beautiful fabrics! I'm finishing the quilting on my Orca Bay quilt, thanks for a great giveaway! I am hand quilting an 8 point star baby quilt...in pink & green! I have my DQS quilt binding to stitch on, and finish my GGA quilt so I can get it on our bed, we had frost last night!! I am enjoying a cooler day and working on a BOM. I'm trying to finish a summery tote for a friend that a started in the beginning of summer. Hope it gets done before fall rolls in... Thanks for the chance to win! I am sewing Wedding Quilts, I have 2 sons getting married in September, I am also in alot of Swaps, and Sew alongs. There's something about charm packs that I just love. Not sure I can put my finger on it, but they all appeal to me. I'm working on quilts for 2 twin boys. Thanks for the giveaway. I'm working on a dress for my aunt's granddaughter. We're trying to get settled into anew house, get ready for school and a new baby coming. I just about finished a Buzz Lightyear quilt for my Grandson who turns 4 on Monday. I quilted it with glow in the dark threads in a meandering loopy 5 point star pattern. It looks awesome! BTW, I love the tiny deer :) amateurquilter at gmail dot com. HELLO! I'M WORKING ON A CHILDREN'S QUILT FOR CHARITY! THANKS SO FOR YOUR BLOG+GIVEAWAY! I just finished a table runner LATE last night. Today, I need to start a redesign for a bee block I am late on, and coordinate the finishing touches on my daughter's birthday party which is Sunday. Nothing like leaving things to the last minute! I'm up to a ton of things! After work I'm picking up a friend then heading to a concert...yoga at 5AM (if I'm up to it, after the show! ), then a new tattoo tomorrow on a much-needed day off from work, then a trip to see my in-law's... I'm going to need a vacation from my weekend! I'm working on an expense report, but chomping at the bit for work to be over so I can sew more Christmas gifts!!! I'm taking a break from babysitting (20 month grandniece is finally napping and 7yo watching tv) to do a quick blog visit. Thanks for the chance - this charm pack make a lovely kid's quilt. I am working on a TARDIS quilt (refrence Doctor Who). I am in the process of figuring out how to FMQ it... I don't know what to do!!! Well, I am procrastinating and blog hopping, but I have a noah's ark to finish, so that will be next, just need to trim it down and finish the binding. I am new to quilting! Two down, starting my third! Where have I been all my life?! 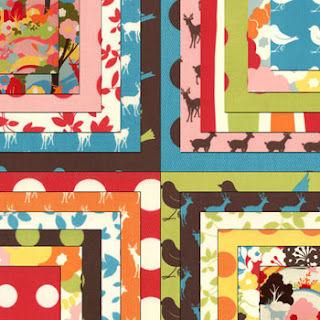 Quilting for my new little grandbabies is next on the list! I am finishing a crazy quilted wall hanging for Christmas which has taken a year to complete. I've just loved the previous MOMO lines and this one is no exception! LOVE IT! I'm working frantically on a quilt for an Uncle's 90th birthday ... this Sunday. I ran into major delays because of problems using injet fabric sheets. Turns out they didn't much like the ink in my Lexmark printer but liked the ink in an Epson printer. Maaaaan ... I finally got the photos printed but I don't expect I'll finish the quilt in time. You ARE going to cry when you say good-bye to your baby. Both of mine (now 25 and 22) left immediately after high school and moved a long way away. I still cry every time they come and go. They've gotten used to it. We've been putting down hardwood flooring at our new house and packing and and and. No time to sew lately. Wahhhhh! But, we should be finished in several weeks and move! I hope to be settled temporarily in the 3rd bedroom and begin sewing once more around September or early October! So looking forward to my relaxation time. I am finishing my first Birdie Sling (for meeee!) and starting on some table runners for Christmas gifts! Oh Deer is so cool! Just finished 3 quilts, got one more to quilt and 3 more in piecing progress. I like to multi-task. i'm attempting to finish a massive olde world map cross stitch for my dad for christmas.. fingers crossed! I just sent off four blocks for the QuiltCon challenge yesterday and today I am relaxing. I was sewing away all weekend and Monday. Well, I have been busy baking and preparing foods for my yearly camping trip with my 2 boys and their families...3 grandchildren ! Leaving early tomorrow...can't wait! Good luck getting your daughter ready for college. It gets a bit easier each year. DS left Saturday for his university. Miss him already and we've talked daily:) Take care! i'm piecing a background piece for some applique pieces, basting hexies, and pressing fabrics to cut for a new pattern and doing a little knitting in between. I am up to my ears trying to quilt a monster quilt for a friend. I am not sure what I have gotten myself into. It is HUGE!! I'm getting geared up to have the nieces over for the weekend. Lots of fun stuff planned! 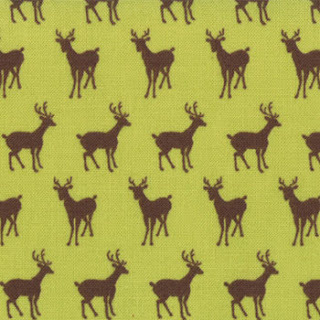 :) I love this Oh Deer fabric! Thanks for the chance. I'm resting from helping 4 of my granddaughters make their first sewing projects. We made 3 skirts and a pair of PJ bottoms. Not bad. 2 of them had never sewed before and the other 2 had sewn some straight seams. I really enjoyed the one on one and was amazed when we'd get to a stopping point and it had been 2 hours since we last looked at the clock. But today I'm resting! These are awesome prints! Love them! I remember my oldest daughters college days. Move out in the fall, back home in the spring. It was like moving a whole house. And the first year, she was on the third floor. Walking up and down three flights of stairs, passing people coming up with boxes, coming down quicker to get more. It's a mad house. After the second year, I quit crying and started groaning about all that moving. lol. I love the scissors too! I agree that the scissors are amazing! This new line looks spectacular as well. I still have company visiting until tomorrow and then I can get back to my sewing room! Thanks for the giveaway. Besides working, getting two kids ready to go back to college and worrying about a ill mother-in-law, I'm working on three block of the months for Christmas quilts. Hope you are having a great day!! Just some heavy pillowcase making today to give to charity. Love those birds in Oh Deer! And also enjoying the fact that I do not have to drive DD from Florida to St Louis for college as she graduated this May! Yay! This is such a great line! I am at the beach with my family this week! Moving furniture around house as 22 and 21 year old sons both moving back between finishing university and starting jobs. Need to stock the fridge. I'm just relaxing for a while before sitting down at the kitchen table to play games with the kids. Thanks so much for this giveaway...such gorgeous fabric! I just got back from clearing out my Dad's house in Texas. He's moved into my youngest sister's house in Tennessee. 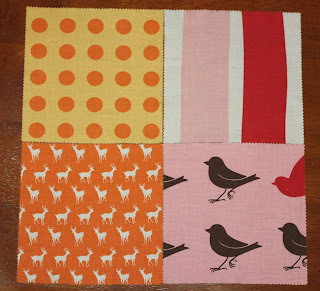 The only quilty thing I've done is plan a row of quilt blocks for our Sister's Row Robin we're doing this year. Thanks for the giveaway. I am getting ready to meet and greet my 11 year old granddaughters teacher, then go 3 hours away to help pack up my 81 year old Mothers stuff for a move to an assisted living center. Thanks for the giveaway. Getting the kids ready for school. 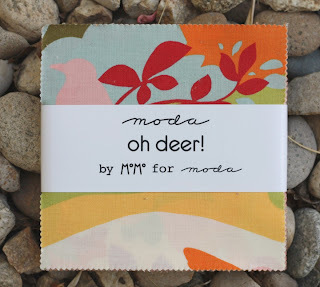 Luckily it is only first grade and preK :) Just finished sewing lunch bags :) Love some deers! Just finished up travel size pillowcases for Grands that are visiting. Must have been out of my mind, ended up with 35 for each of them, LOL! Thanks for the great giveaway. Thanks for the giveaway! I really love a lot of the prints in this line. I am finishing up reading blogs so I can go...sew on a binding :( Not what I want to do next but I cant always be doing the fun tasks! Working on some little stitcheries right now to take my mind off getting my son ready for college too. I'm enjoying the summery weather that we're finally having! Love the fabric. oh gosh I LOVE that line! I've been busy this week getting food in the freezer for when baby comes - only a few weeks left till that! My FIL just surprised us with flying in, we just got back to the house after picking him up from the airport, waiting for our pizza to get delievered! 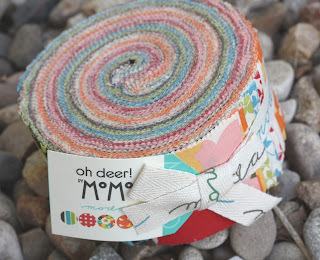 And I am also getting a bunch of projects together for the Friday night sew-in tomorrow night! Oh Corrie, that's what I'm doing too. My youngest daughter heads back to her college on Saturday. We've had a fun summer together, so I really hate to see her leave. The positive side, though, is what a blessing it is to see them become responsible adults and know that youve done your job well! Best wishes to you! I have been setting up my classroom! Hang in there....been there, done that with two of ours. You'll be alright - but it really is tough on mama! Oh, I have to go to the shop and see those Momo precuts! I am starting to lay out a memory quilt for my father with shirts of my step mother. It has been two years and he has finally been able to bring them over for me to start the quilt. He wants a quilt to lay over the back of his couch. I hope I can do right by him. I am getting ready to start another school year with my students! Gearing up for another school year after a really rotten day. Here's to hoping you pick me to make my day just a little bit brighter. Thanks for the giveaway. I am getting back to quilting after having grand babies visiting last month. This is a cute line. I love the scissor print too. Ooo! Love this! I finally got to work on some sewing tonight. I cut a batch of zip pouches! I'd love some of this line. I'm making a Snickers Pie to take to a friend's house for dinner tomorrow night. Back to school! my daughter started student teaching this week. Hubby is a HS principal. Me - I'm reading and quilting a Valentine wall hanging! For me, I'm just getting back to sewing after an enforced lay-off due to a hand operation 2 and a half months ago - it has been so frustrating but it will be so good to be back to sewing, quilting & crafting. Thanks for the lovely giveaway - I'm a huge Momo fan! I am trying to catch up on blogs and flicker after bing on vacation for over a week! sigh...I'm dragging my feet on 2 quilt tops that need to be turned into quilts :/ And I really need to start a baby quilt for a friend's daughter's new baby. Been busy catching up on projects, mostly for my baby girl, as her big brothers headed back to school this week! i'm cleaning because my in laws will be here in less than 12 hours! Just resting right now after a big day at the pool with my grandsons...getting teady for a shopping day with my BFF...then back to quilting a table runner. Working on new projects, mostly for my baby girl, while her big brothers head back to school! Oooh, so pretty! I am doing laundry to get ready for a little vacation with my hubby and the girls for 5 days - first holiday in 4 years, we are so excited... or at least I will be when we are all packed, lol! Cute! My family is on vacation this year in Charlotte, nc. I can't wait to get home! I'm trying to get a quilt finished for a show and chase a 2 year old around the house.